Llig’s previous Listener in December last year was the entertaining Shrive, where two unchecked letters in each of thirteen clues were equidistant from each end of the alphabet — as S & H, R & I, V & E. This week, all but four clues had an extra letter in the wordplay, which would spell out a possible reason for the modifications required to the four remaining clues. I failed on 1ac A lot of money brought in by “faulty” soap, Manuel’s Bar (6), mainly because, although I have been in many Spanish bars, I didn’t know they were POSADAs. 5ac The stage jitters develop slowly in the mind (7) was easier and GESTATE was slotted in. I decided to try the downs dropping from the top row, and OSCAR at 2 went in. Unfortunately, I then got waylaid by 13ac OCTAGONAL, 14ac GARRET, 1dn PROGRAMME and 4dn DOGEATE. Finally, I reached 5dn Pagan German, freely lenient — that’s not new (7) with G + LENIE[N]T less, possibly, an extra letter. 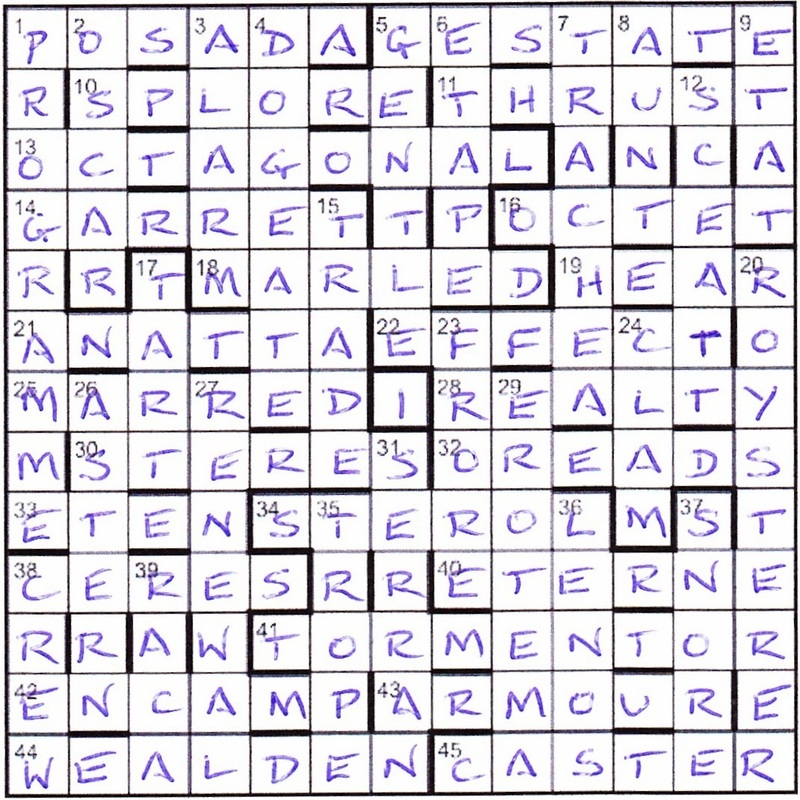 Luckily, looking at the diagram, I could see that there were only 6 spaces for the clue, even though we were told it was (7). A quick scan of the other clues, and I could see that the four normal clues radiated horizontally and vertically from the isolated centre square. With GENTILE being the answer to 5dn and starting with the G from GESTATE, it wasn’t a great leap to wonder if GENTLE was the answer with the I just perhaps going in the centre square. Looking at those other three clues, they turned out to be very easy, and MARRIED, REALITY and SERRIAN were entered without their I. From there, it was a very quick solve and the grid was complete in little over an hour, helped by lots of partial anagrams in the wordplay. Eventually, the extra letters spelt out Whither shall I go then from thy presence? Prayer Book. This is from Psalm 139, verse 6 (or 7 in some versions). I suppose a possible a response could be to the centre, although it seems to me that very few questions in the Psalms actually get answers! So endeth an entertaining, if easy, puzzle — thanks be to Llig. Little did I know at the time that a slightly tougher one was about to follow. This entry was posted on 23 October 2015 at 4:00 pm	and is filed under Solving Blogs. You can follow any responses to this entry through the RSS 2.0 feed. You can leave a response, or trackback from your own site.